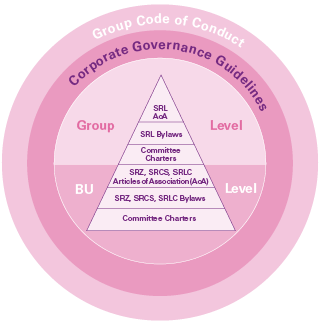 Swiss Re’s corporate governance is embedded in our culture. Measuring a company’s corporate governance based on environmental, social and governance (ESG) criteria gains in importance. Corporate governance developments and trends are changing rapidly and are based on enhanced regulation and evolving political parameters representing a comprehensive topic for the Board of Directors to deal with. A company’s corporate governance does not only need to incorporate legal and regulatory requirements but also has to respond to increasing stakeholder expectations. Measuring a company’s corporate governance based on environmental, social and governance (ESG) criteria gains in importance. The Board of Directors regularly assesses Swiss Re’s corporate governance against regulatory developments, relevant best practice standards and new stakeholder demands. The Board of Directors closely monitors Swiss and global corporate governance developments and considers relevant studies and surveys. The Board of Directors adapts Swiss Re’s corporate governance where it deems it appropriate and beneficial for Swiss Re, its shareholders and further stakeholders. The Board of Directors values feedback on Swiss Re’s corporate governance by its stakeholders and engages in a dialogue with its shareholders, proxy advisors and corporate governance consulting firms. The Board of Directors ensures that Swiss Re’s corporate governance takes into account all mentioned aspects and that the company’s corporate governance is ready to respond to upcoming needs. Information on compensation, shareholdings and loans of the members of the Board of Directors and the Group Executive Committee (Group EC) are included in the Compensation Report of this Financial Report. the Board Committee Charters, outlining the duties and responsibilities of the Board committees. the Board Committee Charters, outlining the duties and responsibilities of the board committees of SRZ, SRCS and SRLC. The SRL, SRZ, SRCS and SRLC Bylaws were revised in 2017 to incorporate stakeholder feedback as well as to anticipate corporate governance, legal and regulatory developments and trends. It is our goal to constantly develop further our corporate documents in order to align them to changing company needs, the evolving regulatory landscape as well as stakeholder feedback. Conflicts of interest may arise where personal interests or relationships might interfere with those of Swiss Re. They may improperly influence judgement, objectivity or loyalty and expose Swiss Re to material adverse reputational and financial risks. We are committed to conducting business in a manner that ensures that we act in the best interests of Swiss Re without actual or perceived influence by our personal interests or relationships. We act with integrity at all times and foster an open and fair environment by being transparent in disclosing our conflicts of interest. We define our conflicts of interest standards and procedures in a series of documents such as in our Group Code of Conduct as well as in the Bylaws. In the reporting year we have implemented the “Global Standard on Conflicts of Interest” (the Standard) throughout the Group with the aim to enhance the existing processes with respect to conflicts of interest across the Group. The improvements also address FINMA’s general requirements to have defined principles for a process and structure to identify and avoid and/or resolve conflicts of interest. the Swiss Financial Market Supervisory Authority (FINMA) provisions on corporate governance, risk management and internal control systems. Swiss Re’s corporate governance furthermore complies with applicable local rules and regulations in all jurisdictions where it conducts business. The Board members deepened their knowledge on the scope and objective of the ALM and on the processes and governance underlying the ALM and the MRB. The Board members were presented with the structure and the main components of the MRB and its limitations and challenges. The Board members deepened their know-how on Swiss Re’s reserving (methodology, strength as well as uncertainties) and the link between P&C reserving and MRB. The Board members also got insights on recent feedback on Swiss Re’s reserving provided by analysts and investors. The Board of Directors appraises the internal risk model’s central role in core risk management activities. It is therefore key to understand the internal risk model and its outputs. During that training session, the Board members received a refresher on the basic principles of the techniques applied, generic modelling approaches as well as statistical measures that are being used. Furthermore, the Board members were provided with insights on the interpretation of the results, the linking of the business view to the risk view and the input of risk figures into other reports and processes (eg EVM). Jay Ralph, Joerg Reinhardt and Jacques de Vaucleroy were elected as new members to the Board of Directors by the shareholders at the Annual General Meeting which took place in Zurich on 21 April 2017. Carlos E. Represas did not stand for re-election. 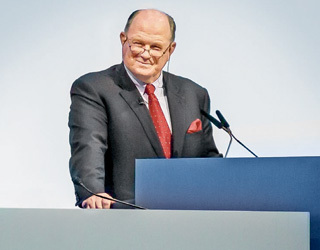 The Annual General Meeting 2017 re-elected Walter B. Kielholz for a further one-year term of office as Chairman of the Board of Directors. Raymond K.F. Ch’ien, Renato Fassbind, Mary Francis, Rajna Gibson Brandon, C. Robert Henrikson, Trevor Manuel, Philip K. Ryan, Sir Paul Tucker and Susan L. Wagner were individually re-elected by the Annual General Meeting 2017 for a further one-year term of office as members of the Board of Directors. The Annual General Meeting 2017 re-elected Raymond K.F. Ch’ien, Renato Fassbind and Robert Henrikson as members, and elected Joerg Reinhardt as a new member of the Compensation Committee for a one-year term of office. The Board of Directors nominated Karen Gavan, Eileen Rominger and Larry Zimpleman to be proposed to the Annual General Meeting 2018 for election as new members of the Board of Directors, whereas Mary Francis, Rajna Gibson Brandon and C. Robert Henrikson will not stand for re-election. In the evolving cyber threat landscape Swiss Re must remain vigilant, agile and responsive to new cyber attack vectors. Swiss Re’s cyber threats are no different to other players in the industry: Swiss Re has to defend its client data, business and employees against a wide range of internal and external threat actors, including cyber criminals or nation sponsored attackers conducting espionage. Cyber Security has become a strategic capability in Swiss Re’s Digital Information & Technology Strategy. Swiss Re’s crisis and incident management and escalation process spans across all operational and management levels, including the Board of Directors. In the year under review the Board of Directors was provided with a major cyber crisis walk through to increase its cyber incident awareness and readiness. Cyber risk is also a regular topic on the agenda of the Board meetings and forms part of the onboarding programme for new Board members. Swiss Re welcomes the dialogue with its shareholders. Swiss Re is of the opinion that it is part of good corporate governance to have procedures in place addressing shareholder queries. Accordingly, Swiss Re has reviewed those procedures in 2017. Edouard Schmid became Group Chief Underwriting Officer and a member of the Group EC as of 1 July 2017, succeeding Matthias Weber who has decided to step down as Group Chief Underwriting Officer. John Dacey, Group Chief Strategy Officer, will become Group Chief Financial Officer as of 1 April 2018, succeeding David Cole who has decided to step down as Group Chief Financial Officer. With that change, the two roles of Group Chief Financial Officer and Group Chief Strategy Officer will be merged. As of 1 April 2018, the Group EC will consist of 12 members as opposed to 13 members up to March 2018.
is a regular agenda item of the Group EC meetings. Amongst the topics discussed are the technology developments and its effects on Swiss Re or Swiss Re’s approach to technology across the Group.